We see a theme here. 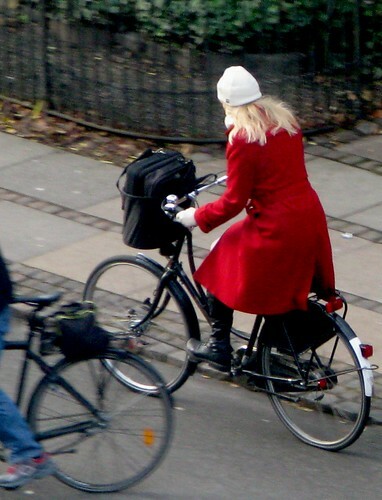 Two cyclists, two locations, both with a red coat and white hat. The colours of the Danish flag, of course [cue boring info: the oldest national flag in the world] but we doubt that was the fashion motivation. Perhaps it was just a desire to splash some warm colour on the wintry streets of the capital. just one great photo after one great photo. i love the subject matter and the compostition. every day, a visual inspiration. keep it up! 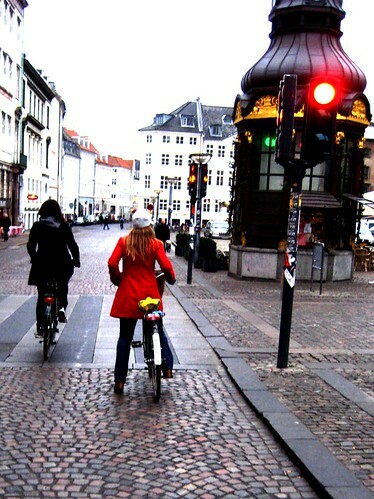 Love this site...In the US, cycling for transportation is considered really wacky and completely unfashionable. And american fashions are impractical for any sort of physical activity or bad weather. So I rely on the photos here to inspire some stylish and functional outfits.